The Tempurpedic mattress has an edge compared to others. Their seal of approval from the National Aeronautics and Space Administration (NASA) has made them stand out from the crowd. 1998 was the year when the company was recognized for successfully incorporating NASA technology into the manufacturing industry. This development was seen as beneficial to society in two ways - it provided an economic opportunity, and helped improve the quality of people's lives. That's why they've been allowed to use the seal on their products. It's a real claim to fame for them since no other brands have ever been NASA certified. They can also take credit for basically inventing memory foam. Before they introduced their product no one had ever heard of the stuff. They started the whole buzz about visco elastic foam which is still going strong today. The US branch of the company was founded in 1992 and this is when their sales really took off. Rarely does a company become so successful so quickly. In 2003 they went public, officially joining the ranks of the major players in the industry and proving that memory foam was not just a passing trend. By 2004 pretty much every major mattress manufacturer had come up with their own version of memory foam and started incorporating it into their products. Many offered their own line of memory foam mattresses and pillows as well as using it in the comfort layers of their traditional innerspring beds. Today you can find it everything from office chairs to slippers. In 2008 the company had a bad year financially just like nearly everyone else in the country. However, they quickly rebounded and were highly profitable again by 2010. In February of that year they donated half a million dollars to the Pancreatic Cancer Research network. The funds were raised through sales of their Tempurpedic Teddy Bears offered at retailers throughout the country. In October 2009 they introduced the Tempur Cloud line which was aimed at consumers who feel that memory foam beds are too firm. This is one of the most common complaints about visco elastic foam in general. The company wanted to find a way to make their product appealing to those who prefer a softer, more cushioned surface, kind of like an ultra plush innerspring mattress. They researched and developed their Tempur ES material which took them over a year of testing different version of their original formula. It finally worked and now they offer a full selection of firmness levels to satisfy pretty much anyone who likes the feel of memory foam. What else sets the original Swedish memory foam mattress apart? 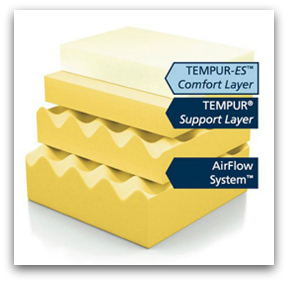 Tempur-Pedic uses Swiss engineering to create their foam. This pressure-relieving material has done wonders when it comes to improving sleep. Swedish researchers spent nearly a decade in research just to find the perfect material. Every detail was planned in order to create the perfect combination of comfort and support. It turned out to be one of the most important developments in bedding since the invention of the innerspring assembly over 100 years ago. Latex mattresses have been around for a long time and share many of the benefits of memory foam (some people even feel they're superior) but for some reason they never really caught on until recently. The company's patented construction with separate layers contributes greatly to their success. By using different base materials, the pressure-relieving effects of the mattress are optimized. While comfort is maximized, support is not sacrificed. Other beds may not maintain proper posture very well but the Tempurpedic mattress is designed to keep the spine straight while a person is sleeping. This combination of foam layers allows the surface to immediately react to the body, conforming to shape, pressure and temperature. This is important because everyone's body is different. The only way to make a mattress which is truly comfortable for all is by using an advanced material like this that can adapt to the person sleeping on it. One of the main things memory foam has been criticized for is sleeping hot. By this we mean it is slow to release heat so you might wake up sweating. Click here for more information on the most common Tempurpedic complaints. The company has answered this concern by incorporating another interesting feature. The AirFlow Base Layer allows air to circulate thus regulating temperature when sleeping. Plus the visco elastic foam actually absorbs energy so that you won't feel it when your partner moves around. You've probably seen their TV commercial with the glass of wine which doesn't spill despite someone jumping on the bed. As a result of all these things, you should get a more restful and comfortable night's sleep. Tempurpedic mattress reviews online at the various consumer product rating sites have been overwhelmingly positive. While it's true they are not for everyone, many people have found relief from their aches and pains. In fact, the Tempurpedic mattress has received several awards from the Arthritis Foundation for their ease of use and proven ability to help sufferers of arthritis sleep better. Over the years, they have consistently manufactured high quality mattresses, constantly improving technology to match the changing needs of the market. Their range of products is quite extensive. In their continuing effort to address complaints, they recently introduced an entirely new line of products called the Tempur Simplicity. Until now there hasn't really been an affordable Tempurpedic mattress. The Simplicity line is meant to offer a mid priced product without skimping on quality. They're priced at about $1500 which makes them available to many people who previously couldn't afford one. The Simplicity line is also the first ever Tempurpedic mattress to offer different levels of firmness, just like a traditional innerspring bed. The new Tempur-Essential material they created for this line offers all the benefits of memory foam, is cheaper to produce and can be manufactured in firm, medium or plush comfort levels. 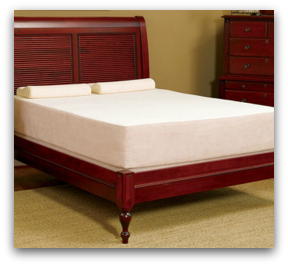 The Simplicity line finally makes a Tempurpedic mattress available to nearly anyone and has been a huge success. 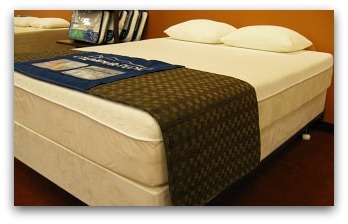 For an in depth look at their product line be sure to check out the many different Tempurpedic beds here. For a complete list of their current mattress prices follow this link to our Tempurpedic price guide.